The world-renowned Galapagos Islands lie on the equator, 600 miles off the coast of Ecuador, the country to which they "belong". In 1986 the Ecuadorian government created the Galapagos Marine Resources Reserve and today the National Park includes 97% of the islands' land and is 50,000 square kilometres in area – that's big! 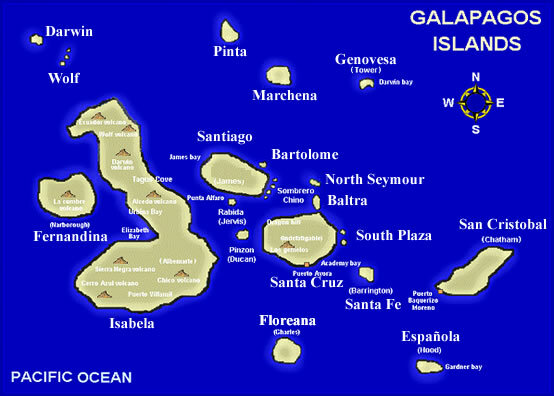 Because the Galapagos Islands are so well known and documented, we all think we know what to expect when we get there. In reality, nothing you have read, heard or seen will have prepared you. It honestly is that impressive, and the wonder of it all is that it remains unspoilt. Perhaps one of the most enjoyable aspects is the close proximity of the wildlife which appears well aware of its star role and seems to tolerate visitors rather than be disturbed by them. Blue-footed Boobies regularly stand in the path, defying you to pass, while Sea Lions will come to play with you while you snorkel. The huge Land Inguanas are quite shy, but their Marine relatives totally ignore people as they carry on with their lives. Bright red Sally Lightfoot Crabs scuttle around the black lava rocks while Frigatebirds cruise overhead, some with huge red inflated pouches under their throats. Many people have tried to find the words to describe the Galapagos Islands but it's simply not possible. You need to experience it yourself!